Today, the Lincoln Commemorative Silver Dollar Coin remembers the dedication in Washington, DC, of the first Lincoln monument by artist Lot Flannery on April 15, 1868. The Committee on the Library, to which was referred House Joint Resolution 127, to re-erect the statue of Abraham Lincoln upon its original site, having considered the same, reports favorably thereon with the recommendation that the bill do pass with an amendment. President Lincoln died on April 15, 1865. A few days later, on motion of Mr. N. D. Lamer, of the city councils of the District of Columbia, a joint committee was appointed to take action in reference to the erection of a monument m the city of Washington to the memory of Abraham Lincoln. This committee met at the mayor’s office on the 28th of April, 1865, and formed itself into an association to be called the Lincoln National Monument Association, to carry out the objects proposed by the formation of the committee. To these were added a number of honorary directors, mostly Members of Congress, one from each State, as it was hoped at that time to secure a national subscription to the end of raising a monument at the National Capital, the most suitable place, properly commemorative of the life and character of the lamented deceased. Owing, however, to the springing up of kindred associations in almost every State and city in the country, this hope was not realized, and with the exception of some contributions from Baltimore, among which was a handsome sum from John T. Ford, Esq., the proceeds of a benefit for the monument fund, given at his Baltimore theater, little, if anything, was contributed outside of Washington. The money raised was, however, carefully husbanded, and was invested by the treasurer, Mr. Riggs, in Government registered bonds. The sum raised was, of course, inadequate to erect a monument on anything like the scale originally proposed, but was yet sufficient to raise a monument in the shape of a shaft and statue, creditable to the city; and it was determined by the association that this was the best course to pursue. Mr. Lot Flannery, of this city, who had achieved a number of successes in his art, among which is the admired monument over the victims of the arsenal explosion at the Congressional Cemetery, was the successful competitor for the work. The monument was about 40 feet in height to the top of the statue. It rested on a solid foundation of blue rock, 6 feet in depth. The base was an octagon, 6 feet in height and about 7 feet from side to side, on which the base of the column rests, the lower part corresponding with the base, and the upper part with the shaft, being circular and molded. The shaft was 18 feet in height, with an average diameter of 3 feet (tapering), and surmounted by a molded cap, 4 feet square and two feet thick, on which rested the base of the statue, and the statue itself. The figure at this height looked to be about life-size, and stood facing south. It represents Lincoln standing with his left hand resting on the emblem of Union — the Roman facile — his head erect, with a slight inclination forward, and right hand partially open, as in the attitude he was wont to take in addressing an audience. The design was first made in clay by Mr. Flannery and was subsequently cast in plaster. The model attracted much attention as a spirited design and excellent likeness. The encomiums bestowed upon his design induced him to submit it to the managers of the Monument Association, and the result was that it was unanimously selected from the various designs and models before the committee as the best offered. A contract was entered into with him by which he agreed to have the monument ready by the 15th of April, 1868, the anniversary of Mr. Lincoln’s death. He devoted himself to the work, and the reproduction in marble was held to be greatly superior to the model. The statue was dedicated on the third anniversary of the death of Lincoln. Department business was suspended as well as that of the municipal offices, and the public schools were closed to afford opportunity to all to witness the dedication. Flags were displayed at half-mast, and the heavy boom of half-hour guns reminded of the solemnity of the occasion. The procession formed at the corner of Ninth and D Streets, and about 1.30 o’clock the line of march was taken up, when some of the members of No. 2 Steam Engine Company commenced to fire a salute from a fieldpiece in front of the engine house. The right of the line was by the Grand Lodge of Masons, with members of the subordinate lodges, marshaled by A. M. Howard, and headed by the Marine Band. The Sons of Temperance and Good Templars followed, Mr. John S. Hollingshead marshalling the former, assisted by George D. Egleston, of Metropolitan Division, W. H. Gonzalves, W. H. Harrison, C. H. Frost, J. S. Erly, J. W. Roberts, of Good Samaritan, and W. H. Chase. The band of the Twelfth United States Infantry headed the Sons, the Grand Lodge having the right of the line, followed by delegates of all the subordinate divisions. The beautiful flag of Federal City and fine banner of Good Samaritan divisions were in line. The Temple of Honor followed, marshaled by J. S. Stokes. The Good Templars came next, the Grand Lodge being at the right of the line, followed by a number of the members of the subordinate lodges, marshaled by W. P. White, C. T. of Harmony Lodge, headed by Heald’s Band of 17 pieces. The Grand Lodge of the United States of the Knights of Pythias, which was holding a session at Odd Fellows’ Hall, Navy Yard, formed at the hall, and with members of the subordinate lodges marched direct to the City Hall, reaching the grounds before the main procession arrived. During the forenoon workmen were busily engaged in erecting a stand between the monument and the curbstone, 52 by 16 feet, capable of seating about 400 persons. From the flagstaff on the City Hall the national colors were displayed at half-mast, and the corporation offices were all closed at 12 o’clock. The large derrick had been removed from over the monument, and everything in readiness for the ceremony before 1 o’clock. The crowd began to gather about 12 o’clock, and in less than an hour the steps and portico of the City Hall were densely packed. By 2 o’clock the entire space in front of the City Hall was crowded, while the housetops and windows of the houses opposite were filled with human beings. All the sanitary police, under Lieut. Noonan, were on duty. No one was allowed upon the stand except those who had been invited by the committee. About 400 invitations were issued by Mayor Wallach and the committee to Cabinet ministers, heads of bureaus, Army and Navy officers, members of the Diplomatic Corps, and other distinguished persons. Invitations were also issued to the Senate and House of Representatives, but owing to the impeachment trial it was impossible for them to attend. Among those present were President Johnson, accompanied by Col. Rives and Mr. Kershaw; Baron Gerolt, Mr. Rangabee, the Grecian Minister; Maj. Gen. Hancock and Gen. Mitchell, Gen. Emory, Col. Capron, commissioner of agriculture; Ambrosio Abeita, Alezandro Padilla, governor of the Pueblos of Isleta (one of the 19 villages of the tribe in New Mexico); John Ward, agent; Gen. O. O. Howard, Mr. Cantazalli, secretary Italian Legation; Admiral Radford, Assistant Attorney General Binckley, Gen. Charles Thomas and Gen. Morris S. Miller, Gen. Carr, of Gen. Emory’s staff; Gen. S. F. Carey, of Ohio; John Hitz, Esq., Dr. John B. Blake. Gen. Grant was present, and occupied a position on the sidewalk in front of Mr. Bradley’s office, declining to take a seat upon the stand. The assemblage was very large, and commenced to assemble in front of the city hall long before the hour for the ceremonies. At 2 p. m. the crowd, despite the rain, had so increased as to extend down Four-and-a-half Street below the Presbyterian Church, down Louisiana Avenue, beyond Fifth Street, and an equal distance down Indiana Avenue. The open space at the intersection of these streets was densely packed, and the steps, areas, roof, and windows of the City Hall Building were closely occupied. The roofs and windows of all the buildings in the neighborhood were thronged, and the boys, as usual, secured eligible positions in the tree tops. The attendance of colored people was very large, filling the space in the rear of the stand. There were probably from 15,000 to 20,000 present. It was undoubtedly the largest gathering of people ever assembled in Washington on such an occasion. The following was the program of the ceremonies: Prayer by Rev. Dr. Hamilton; music, by the Twelfth Infantry Band; dedication of the statue by the Masonic fraternity ; music by the Marine Band ; address by B. B. French, Esq. ; music by Twelfth Infantry Band; unveiling of the statue by the President of the United States; music by the Marine Band; introduction of the artist; benediction. 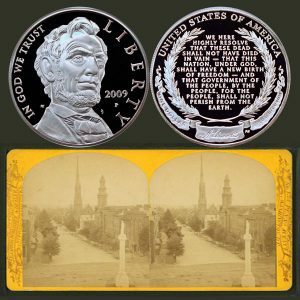 The Lincoln Commemorative Silver Dollar Coin shows with a stereograph image of the marble statue, circa late 1860s.